MPPT using precise function, APL functions, solar panels automatically adjust to maximum output power, simply connect directly to the solar panel grid inverters, do not need to connect the battery. AC phase angle of 0 through isolation amplifier and input to the MCU for high-precision detection and analysis, the phase shift rate of only <1%, thus achieving high-precision AC and combining with the phase modulation. output. In the course of the grid, usually with the same phase angle and the net (ie, two-phase alternating current total is equal to 0, with the switch to the two AC fusion) and the product is first rectified AC half-frequency AC to 100Hz, Then the machine produces high frequency current in the circuit and semi-100Hz frequency alternating current generated combination, to achieve high-frequency modulation. The current strength of the different fluctuations, we should use the MPPT function, when the MPPT function adjusted to the maximum power point, the product automatically powers locked in maximum power point, the output power is more stable. When the city power system planning power outage there is a failure, the inverter will automatically turn off the output. Multiple machines in parallel can be used to achieve a small power inverter in parallel for the power output. Use high-frequency converter to make high efficiency. In overcast weather,the solar battery’s output current is extremely tiny, then inverter will automatic open 6-grade power search function. 1. The program can automatically open power adjustment for 6 times. 2. The current direction can adjust from the maximum to the minimum. 3. In automatic adjustment process, we will see the LOW light flashing. And the power will keep as a starting point, from 0 to the maximum output power, and it will restart at most for 6 times, then locked in the maximum power, the ST lamp long bright. 4. It need 10 minutes for 6-grade power search. 1.Solar Panel: Recommend using the power more than 30W and the standard voltage of 17.5V PV panels. Recommend using multiple solar panels. Solar panel in series will result in high-input voltage which will exceed the working voltage range of the inverter. 1. 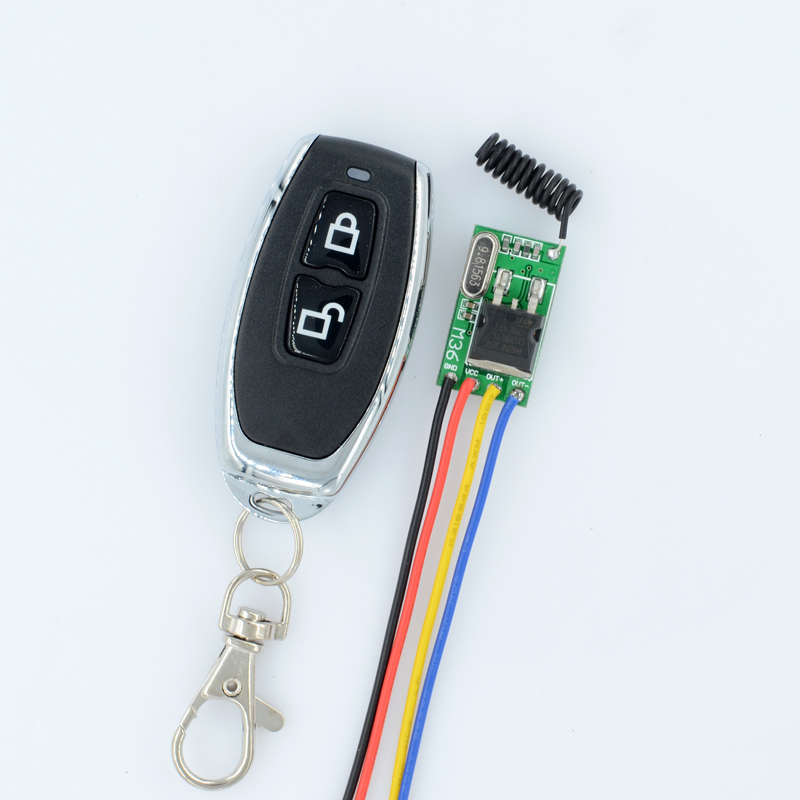 Low-voltage protection (input DC voltage is less than 10.5VDC). 2. Over-voltage protection (Input DC voltage is greater than 28VDC). 3. Over-temperature protection (when the chassis temperature is above 75 C.
the temperature dropped about 2-10 minutes to restart automatically after cooling). 4. Fault Protection (when 110VAC or 230VAC power outage or shutdown). 5. 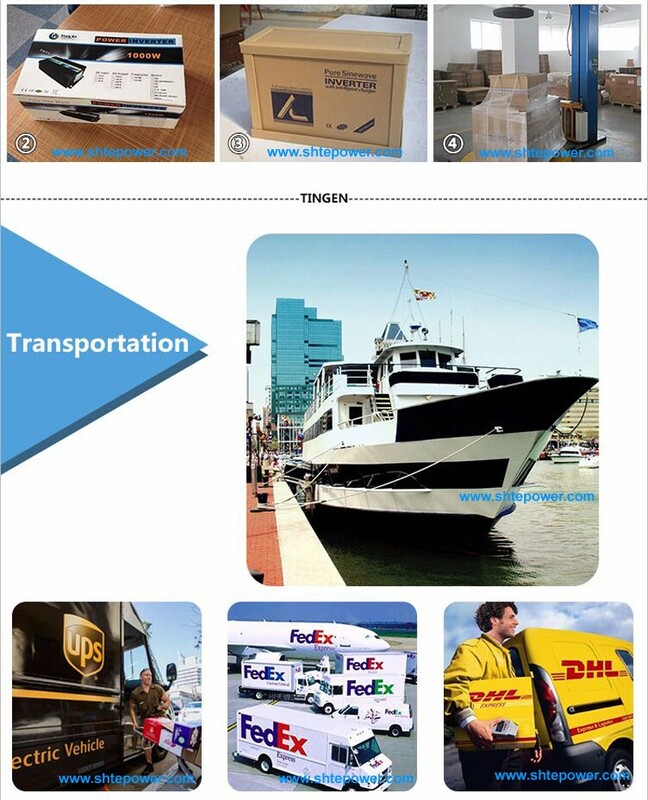 Islanding protection: When the electric supply stop, the inverter automatically shut down output. 1. Green LED flashing: The inverter is adjusting power output. MPPT is in working condition. 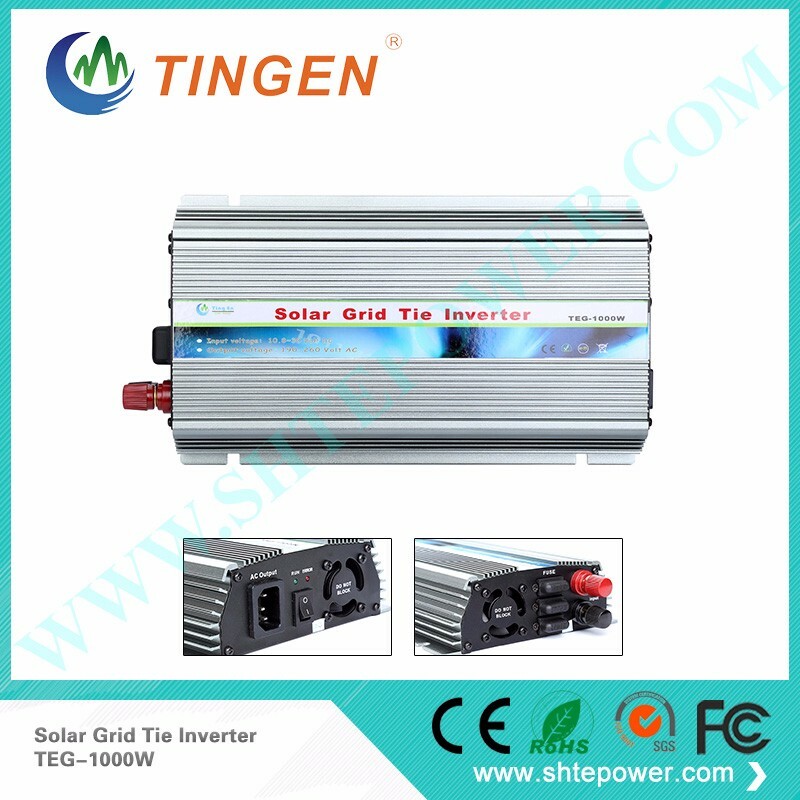 2.Green LED long in time: The inverter is in working condition with the maximum output power. 1. 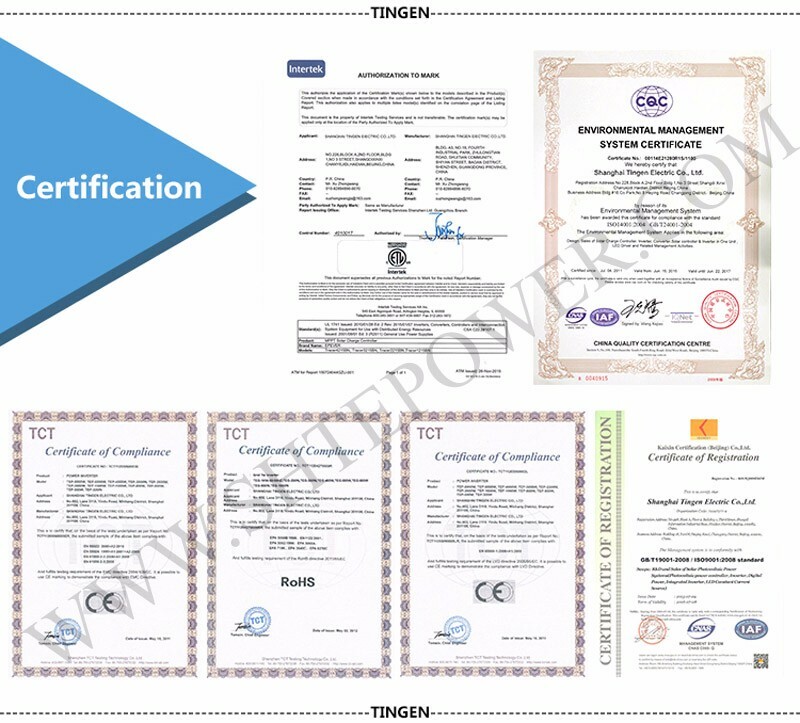 Please leave us output voltage(AC 90V-130V or AC 190V-260V) and outlet Plug (A or B or C or D) so that we can send you the perfect products.